Following the supercar-centric meet at Hanyu Parking Area the day before, I wasn’t sure of what to expect from Daikoku as basically everything one could possibly want to see was already at Hanyu. But like always, Daikoku never failed to surprise. Unlike Hanyu, which ended at around noon, the New Year meet at Daikoku is essentially an all-day event with cars coming in and going out constantly. We got there bright and early around 8 a.m. to make sure we didn’t miss anything. It turned out we didn’t need to get there that early because if there was something this meet wasn’t short on, it was unique and interesting cars. A normal meet at Daikoku is always a good showcase of the diversity of Japanese car culture, but the New Year meet always goes above and beyond all expectations. Like most other meets at Daikoku, or indeed at any other parking area in Japan, this was largely unorganized. It’s more of an impromptu meet where clubs and groups of friends come together during the New Year holidays. A quick look around the car park, which still had some empty spaces available, you could see who came together in a group. The Alfa 155 GTA-Z, R34 Nissan Skyline GT-R, Lancia Delta Integrale, and E30 BMW M3 from Tochigi prefecture were lined up like the dream garage of someone who grew up in the ‘80s and ‘90s. Call it Radwood Japan. Elsewhere, there was a gorgeous Mazda Cosmo. These rotary legends are going for around ¥10,000,000 ($88,300) in Japan at the moment, which was a surprise to me as I was expecting these to be going for a lot more. Speaking of expensive classic Japanese cars, it was a shame no 2000GTs showed up this year. No problem though, because there were more than plenty of classic iconic Japanese sports cars to satisfy. Early on, a ST185 Celica GT-Four rolled in with a Mitsubishi Evo VI behind it. I’ve been going through a bit of a Celica phase at the moment, particularly the later ST186 generation. One of those with the Castrol livery would be quite nice. Soon more cars started coming in, including the Nissan Stagea wagon with overfenders, a Millennium Jade R34 Skyline, and a stanced Lexus IS F.
It didn’t take long for the obligatory Liberty Walk cars to arrive, mostly GT-Rs with a lone M4 and Murcielago joining in later. Other highlights include the Lancer Evo in full Ralliart livery, the Star Road 240Z, widebody R33 GT-R, Rocket Bunny 350Z, a clean NA2 NSX, a Pajero Evolution (I nearly forgot about these), and a R33 Skyline with a R34 front. Before moving on to the other cars, it would be rude not to mention the Shakotan or Kaido Racers that were spread out Daikoku. 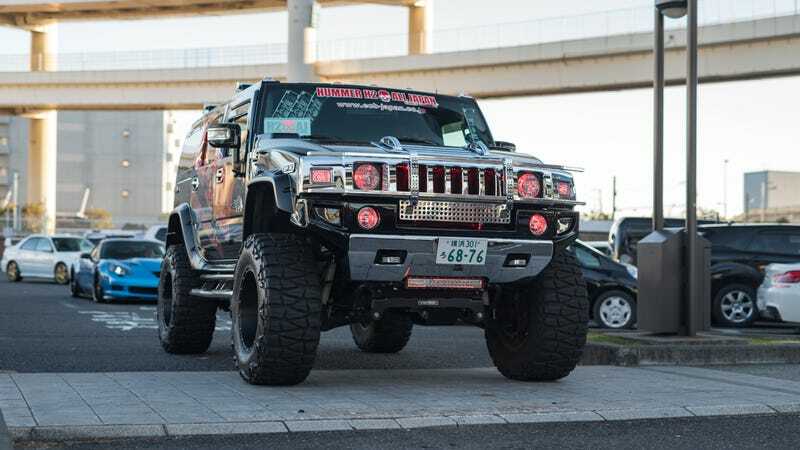 This subculture is perhaps one of the most recognizable with the lowered stance, widebody look and amazing decorations. Quite a rare sight in central Tokyo, these cars tend to hang around the city outskirts. It was great to see a few of the owners roll in together. These guys were more than happy to slow down for photos and videos. While the various Japanese cars caught my attention more than the exotics, it was hard to ignore the wide spectrum of colors that came down the entrance ramp as the Anija crew rolled in. We’ve already seen most of them the day before at Hanyu but that didn’t stop them coming in with style and noise. If anyone shows up to a meet in a Lamborghini and doesn’t have the scissor doors up, they seriously need to reconsider their lives. Or perhaps they don’t want to attract unwanted attention. The Anija crew weren’t even parked up for half an hour until the police came to kick them out of the bus and truck spots. There was no such issue at Hanyu. One of the best moments was when a Ferrari 458 reversed into a spot right in front of the police car while the officer inside was telling him not to over the loudspeakers. Unwillingly the Anija guys left but they took their time. Soon after one supercar crew left, another arrived. Team KHR, another supercar owner’s group with a wonderfully unique style and equally flamboyant owners, arrived with a convoy that was at least a dozen strong. Some of their cars included a McLaren 675LT Spider, Ford GT, Ferrari 599 GTO, widebody Audi R8 and several Aventadors. These guys basically just parked around the same bus and truck parking area as Anija, which then forced the police to come out. Amusingly, the guy in the LT was on the phone and told to move his car, so he did. Then the policeman stopped him because he was still on the phone. I’m sure there’s a sitcom in there somewhere. While most of the supercars came with groups there were a few lone wolves or those that just came with a couple of friends. The Koenigsegg CCX and Radical RXC were among the stars of the meet. Everyone rushed towards them to get a pic of the two unicorns together. There were also two Porsche Carrera GTs, one of which was a white car from Anija. The stock Ferrari F40 (you know it’s Japan when I have to mention whether an F40 is stock or not) and Lamborghini Diablo GT were some of my personal favorites from the day. Other highlights include the Countach 5000S, an Alfa Romeo Giulia QV that was actually working and the Ford Sierra Cosworth. This particular car looked well used. Another car worth mentioning was the Saker, a kit car from New Zealand. Then there were the Americans. Everything from hot rods to low riders and even a Hummer or two showed up. It was the low riders that I was most interested in. Apparently these guys were on their way to a show or meet elsewhere and just stopped by Daikoku to catch up. These cars don’t really come out much so it was a rare opportunity to see so many of them out in the wild. I didn’t need to go to whatever show they were going to because some were already entertaining us at Daikoku with jumps and incredible modifications. The pink 300C with the Phantom-esque front, rainbow spinners, and bedazzled Spirit of Ecstasy was simply stunning. These lowrider guys and girls, and I suppose other American car enthusiasts in Japan, are part of the same group of enthusiasts as the shakotan group with the same counterculture views. In a country where conformity the norm, it shouldn’t come as a surprise that it’d breed a hidden desire to stand out. These guys are clearly having fun doing so and everyone else at Daikoku seemed to enjoy their showboating too. That’s what I love about these meets. It’s a melting pot of people and cars from very different backgrounds appreciating and admiring each other’s work. The best moment of the meet for me was when a bunch of the low rider guys walked towards the Koenigsegg and Radical with their jaws dragging on the ground. There was a lot of “sugoi” (amazing) and “kakkoi” (cool) being said out loud. Finally, there were the crazy vans. The ones with the fins, extended bumpers, and wild colors. This subculture is appropriately called “Vanning.” I mean, it’s to the point. While the supercars were the highlight for many others, these were mine. It’s not unusual to see one or two at one of the night meets at Daikoku sometimes but I’ve seen so many together. There must’ve been about a dozen of them. With all those fins, it looked more like a herd of whales than a gathering of vans. Is it a van or a yacht? It ranged from your typical vanning, erm, vans with the big bumpers and fins to some downright crazy ones. There was one that could give some luxury yachts a run for their money with a “deck” at the back and a well-stocked bar. The table with the cup holders was a nice touch for drinking on the go. The one with the taillights that looked like they came from a Nissan 180SX was quite interesting too. Either way, it was the best way to end this meet. But when I thought I had seen it all, a dekotora truck with an amazing koi fish painting on the side showed up. It’s a shame it wasn’t darker otherwise he might’ve blasted the epileptic LEDs. I can’t imagine a better way to kick off all things cars in Japan in 2018. If you want to see the weird and wonderful diversity of Japanese car culture come to the next New Year’s meet in 2019. Or perhaps the Tokyo Auto Salon. Perhaps the next Anija project car? I wonder what’s easier to park; a truck or the Countach?